The Stitchin' Sheep: Have You Been Drinking Again? That's whisky I smell on your breath, isn't it? I mean, that's the only explanation for why this picture is so blurry. You're obviously drunk! Don't try to give me excuses. And, don't even think about telling me that maybe I moved while snapping this shot. Because I didn't. That kind of thing just doesn't happen to me. So, squint a little with me and maybe we can admire the finished (well, all except the neck band that'll be added on once the front and back are sewn together) front to Lambchop #2's cable sweater. So far, so good. It looks like it'll even fit him. Funny thing is, stretched only a bit, it looks like it'd fit his sister, too (she's 2 1/2 years older). He's got his daddy's body shape. Dad's about 6'1" or so, and it's all in the torso. Lambchop #2 is almost two now. He's about 6 months ahead in the height curves (at least for French curves), but he still fits into his 18-month-old pants just fine. Basically, I've given birth to a chimpanzee. In a year or so, his arms will have lengthened, and they'll be scraping the floor as he runs. He'll look really cute in his sweater while he does it, though. And, dagnabbit, isn't that what it's all about: looking fashionable even if your knuckles drag on the floor. Oh, and for those of you observant enough to have noticed... no, you aren't crazy. This is not the same design I had originally shown you a week or so ago. That one had all cable rib stuff and was just way busier than I wanted. So, I frogged it all (I had gotten up to the arm hole decreases) and started fresh. 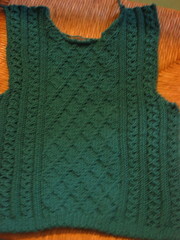 It still has aspects of the busier one, but I added more stockinette style ribbing and the diamond pattern. I like it much better now. It actually looks much more masculine than the other attempt did (you may remember I was worried about that).